As a child, Vilas loved drawing and being creative, but it was not until his late twenties that he discovered meditation which lead to his increase in confidence to follow his dreams to become an artist, particularly working in ceramics. Clay, paintings, prints and the use of digital media. Vilas’s work is based upon and flows from inner life of self-enquiry that encompasses prayer, meditation and service. He concentrates on the spiritual heart, which encourages a simplicity that guides both his life and work. His main body of work is figurative and narrative pieces. His recent figurative works are from the series ‘Zen Rogues’ which developed from iPad drawings started in 2011. Inspired by the new digital medium and using an app called ‘Zen Brush’ he drew upon his love of Japanese Brush portraiture especially by the Zen Master Hakuin Ekaku (1686-1768). Vilas translated his digital portraits into three dimensions. 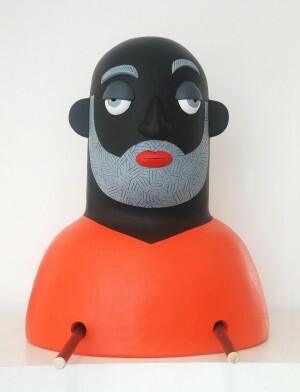 This resulted in a series of small ceramic heads together with 3 larger ones; Rico, Goldy and Big G.
2014 ‘Zen Rogues’ at The Sri Chinmoy Centre Gallery, Edinburgh.